Blogger's Note: This is the third and final installment of a blog series based on my presentation "Authentic Marketing: Living Your Best Brand and Staying True to Yourself." Click here to read Part 1 and here to read Part 2. In Part 1 we established what it means to be authentic. In Part 2, we did some brainstorming and exercises to begin building a brand. In this post, it's time to take all of that and put it towards creating a viable marketing plan that is not only sustainable for you, but feels totally legit. 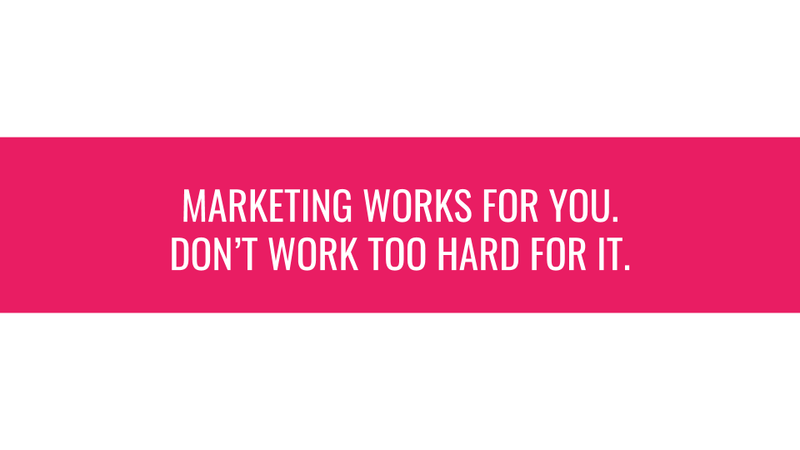 Before we look at some examples, again, I really want to make these points point: your marketing plan should be what works best for you and your brand. Whatever you do should feel authentic to who you are as a person and author. It's your plan, your life, your career. Like the stories you produce, the marketing you do might take work, but it will hopefully fill you with pride and maybe even joy. Seriously! There is no one-size fits all with marketing, so you might as well find what you can do confidently and embrace it. With that, let's think back to Part 1 when we thought about all the things we hear we "have to do" as authors to sell our books. This isn't a full list, but some that come to mind are having active presences on Facebook/Twitter/Instagram, building a private reader group, sending newsletters, running ads (on Facebook, Amazon, etc. ), running a blog, holding giveaways, podcasts, book signings, videos, etc. Do you feel a little overwhelmed looking at that list AND seeing the etc. on it knowing there's still more you are "supposed" to do? Yeah. Me too. That's okay, though. 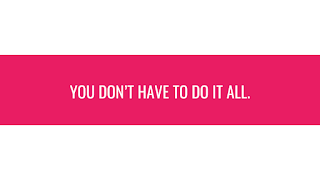 Remember, we don't have to do it all. Instead, I'm going to share a couple of examples from friends who have fully embraced one of those avenues. 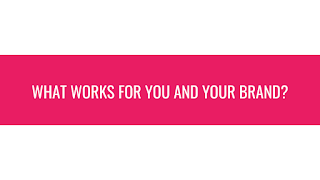 That's not to say they don't also use other marketing tools—because they do—but they each have an area where they truly shine and have made it their own in a meaningful and authentic way. Quick disclaimer: This is going to echo what I said before, but I really want to bring this home: These are their approaches and what works for them and how they are building their career. That doesn't mean you have to run out and try to do the same thing unless it sounds like something that fits you and your brand. Andrea Johnston, a contemporary romance author, is fantastic at engaging with her readers through a Facebook Reader Group. Her personality really comes through and she builds connections with her readers while also building excitement for her upcoming releases and backlog. You can also see some pretty impassioned conversations about the Real Housewives franchise. “I found that what works for me is being true to my brand and authentic within myself. I’m very transparent with my readers and I keep them in the loop: if I’m going to miss a deadline or if a release may be delayed. But I also spend time with them. And the one place I do that is in my Reader Group. Building a Reader Group has been a long process, but it’s also been so fantastic for my readership and building my brand. My Reader Group isn’t necessarily a Street Team where the goal is to market and push release information and things like that. What I do is post all of that in my group and I do some giveaways—a signed paperback or $5 Amazon gift card or something for folks who do that kind of work. “It’s also a place where I just hang out with my readers. I find that once they can relate to me as a person, it just all falls into place. They read my books. They share my books. They share my information. They visit me at signings. They purchase signed paperbacks. And it becomes full circle. “Marketing books to readers can be tricky, especially when book selling sites such as Amazon and iBooks are flooded with so many books. The thing I’ve learned over the past few years is to market yourself rather than your books. That’s not to say you shouldn’t advertise your books, but there are other ways to obtain readers. 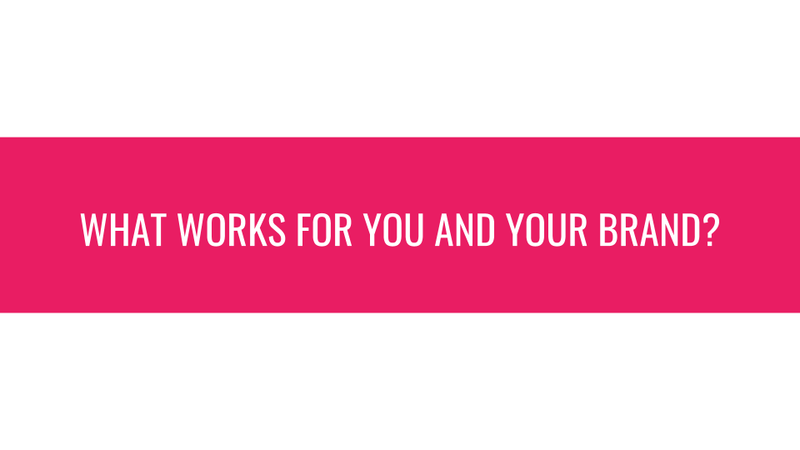 “My newsletter has been a trial and error process, and I think I have finally learned what works for me and my readers. There are many newsletter options out there such as Mailchimp and MailerLite. 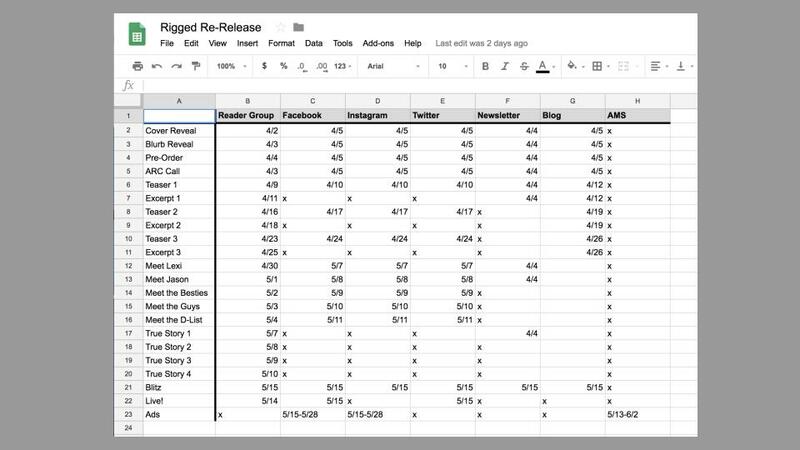 You need to find what meets your budget and your prospective mailing list number. Now, it's time for an exercise to help shape what your approach might look like. Answer the following questions as truthfully as possible. 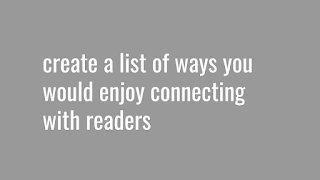 How do you currently connect with readers? Who is your current demographic? What do you hope to accomplish with your communication? What are you communication strengths? What information are you comfortable sharing? What are your tech strengths and limitations? What is the most efficient use of your time? While we let this simmer, let's talk about what you'll actually include in your marketing: content. 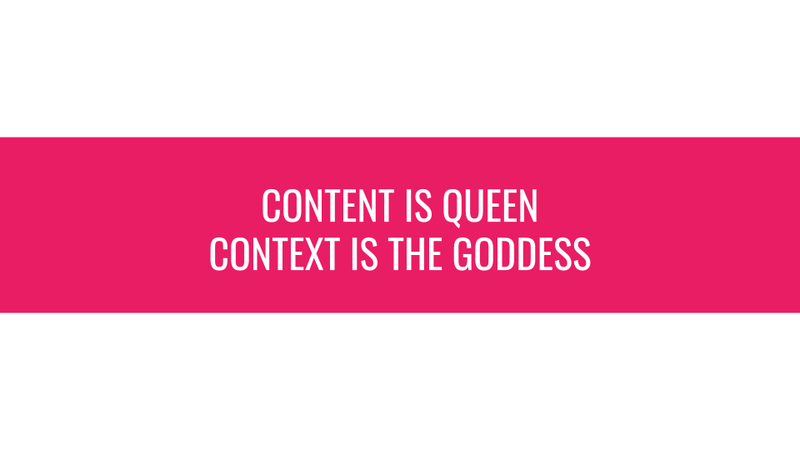 Have you ever heard that content is King? Well, I like to say it's the Queen but Context is the Goddess. Am I comfortable sharing this? Make sure you're happy with your answers before clicking "post." As a note, you do not to be the original creator of content to share it. Sharing content is how it goes viral. Just make sure it's publicly available and you give credit where it's due when you post it. This is one of the best ways you can support a fellow author or friend. They put time and effort into writing their blog post, recording their podcast, taking a photo and so on. By sharing their message (as it fits with your brand) you are helping share their creation with the world, while also saving yourself the time of creating something else. Along the same grain, "liking" or "favoriting" a social media post is another quick way to show support for a fellow author. It theoretically boosts the posts' visibility and hopefully your friends will reciprocate when you share your own content. 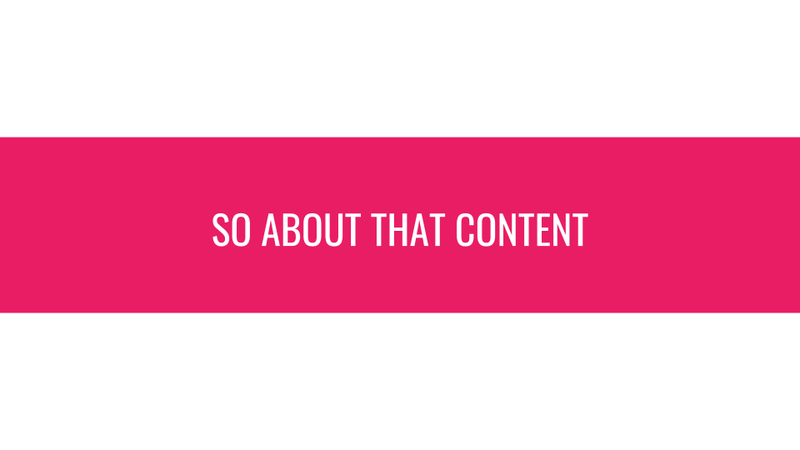 If you're unsure about what kind of content to create or how to find what works for you, I suggest reading The Impact Equation: Are You Making Things Happen Or Just Making Noise by Chris Brogan and Julie Smith. I'm not getting any kickbacks for sharing this, but when I read the book about five years ago, it totally changed the way I viewed what I posted for my brand and other brands I managed. It's time for another exercise as we let this take shape. What are your current skills and resources? What skills would you like to have? How can you most effectively use them? Who do you know with mad skills who might be willing to do a "trade" with one of your skills? 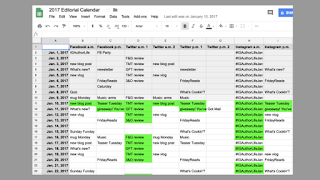 How much time can I devote to Marketing on a daily, weekly, monthly basis? Based on your answers, identify a few marketing channels you'd like to try using. Think about how often you'd like to use those avenues and what you'd be comfortable sharing both from a personal privacy standpoint and a tech comfortability. We also have to think about how to look at marketing. 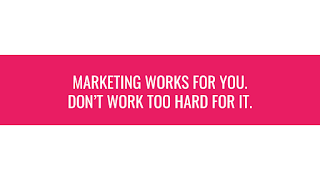 I basically focus on two types: everyday marketing and campaigns. Everyday marketing is how you reach and engage with readers between sales pitches. Remember Andrea and her Reader Group? She recently posted a "Never Have I Ever" prompt and asked people to list a show they have never seen. Her readers left their answers, she shared her own and now they know each other better. Beyond the value of being better connected, Andrea now has an unofficial survey telling her more about her readers. She better knows their interested, and this demographic information could be helpful in finding other readers through targeted ads. 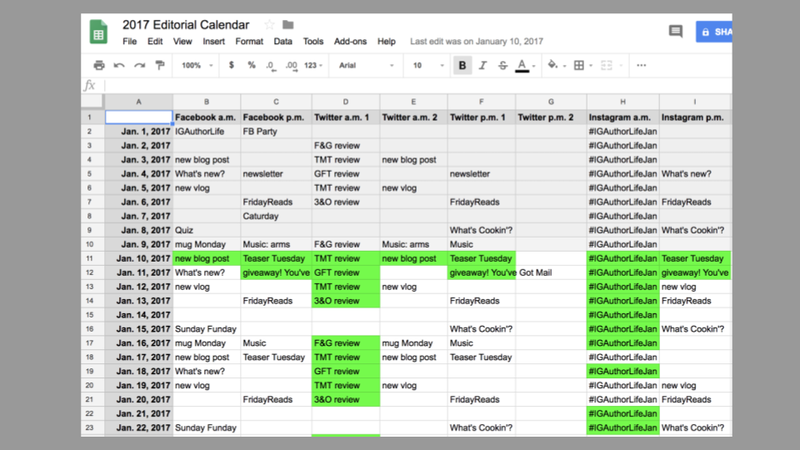 Other everyday marketing content ideas: Posting your excitement about a sporting event, awards show, movie, TV show, etc. 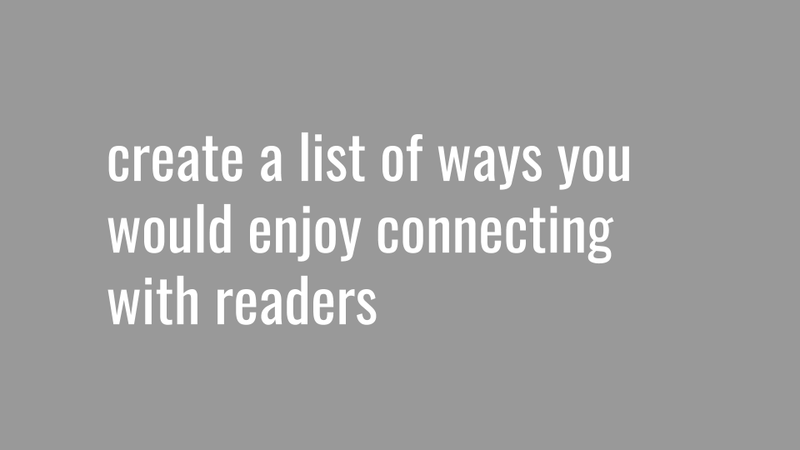 These are shared experiences and a great way to connect with your readers. And if you write sports romances, it fits nicely in the audience your building to post a photo of yourself at a football game. If you have stories set with fashionistas in New York City, sharing an article about Fashion Week is spot on. These are all effective ways of connecting with readers between sales pitches. Here's an example of one I did recently. I'd snapped a poolside selfie during a down moment in the Hamptons and asked my readers what books they were taking to the pool this summer. 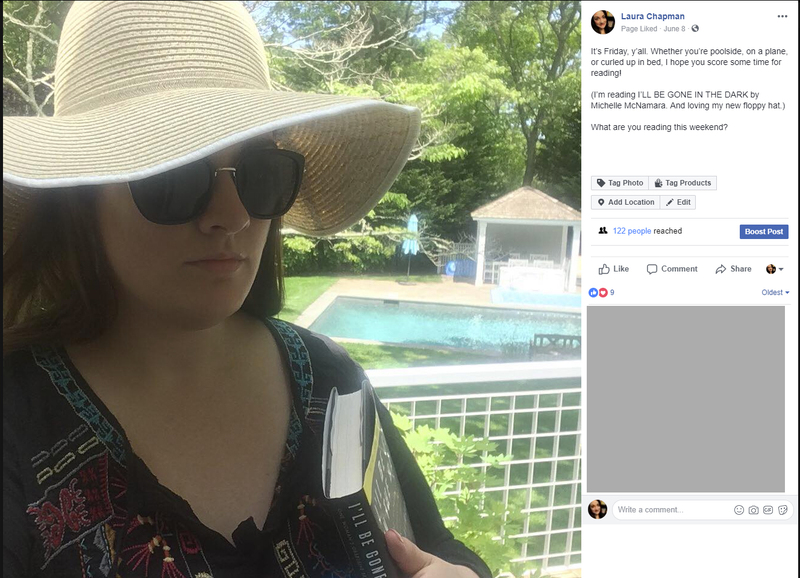 I didn't get a ton of responses (and most were related to my fab hat), but it was a fun way to connect. If you're most comfortable when you have a plan, this may be a good fit for you. Like I said, I don't follow this especially now with the exception of my newsletter and blog post schedule. I do that mostly to avoid repeating myself. Otherwise, I post on the fly. Find and use whatever works best for you. Campaigns are another way to reach readers. These typically require a little more planning and will usually coincide with a new release, sale or some other specific goal. Here's a post I shared this spring. 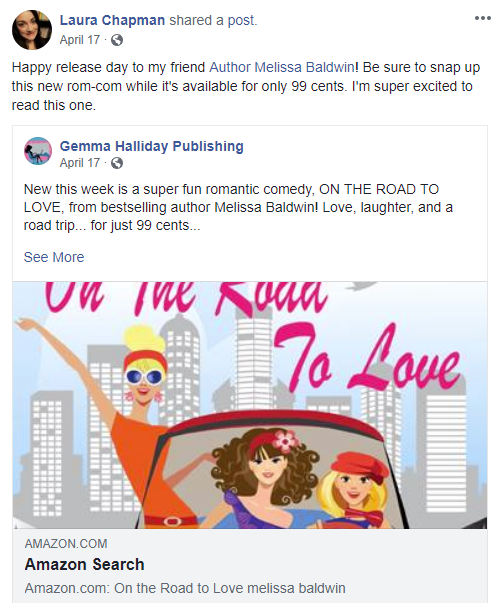 It's a double example, because it shows how you can share someone else's content, but it also illustrates an on-brand campaign post created to promote a new release by my friend Melissa Baldwin. Months out, I start thinking about how I'm going to share different elements and where. 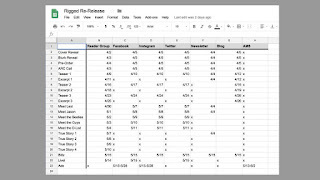 I also create an advertising budget and look at when it will run (and how much I'd like to spend). I like to be particularly thoughtful and organized about it so I can share the information effectively and without sounding like a broken record by using the same images and text over and over. But again, if this doesn't feel right for you, don't do it! Did I feel okay doing? Can I sustain this going forward? If the answer is "no" to any of these, it's okay to stop. 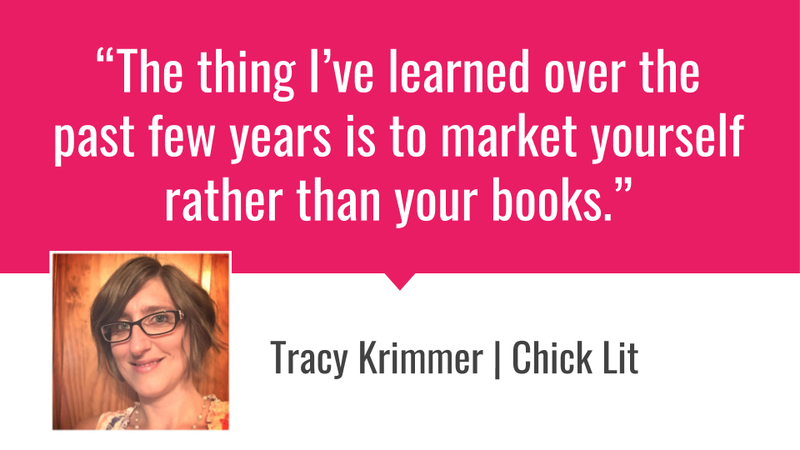 There's no shame in doing what's best for yourself and your brand. I truly believe that when you find a marketing plan that you enjoy and feels sustainable, there's no way to lose. 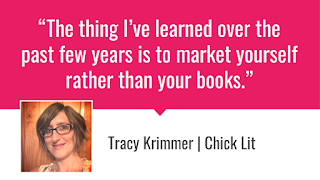 Whether or not every audience member becomes a reader or you become a best-seller, when you market authentically you have been true to yourself and created work that makes you proud. You've done your best on your own terms. That's always a win. Did you miss a post? Click here to read Part 1 and here to read Part 2.